Caldric Blackwell is a children's book writer. Today we are interviewing him about his easy chapter book, The Enchanted River Race. Thanks for doing another interview with us. Today we're talking about one of your earlier works called The Enchanted River Race. Tell us a bit about the book. It's an early chapter book aimed at ages 7 to 11. 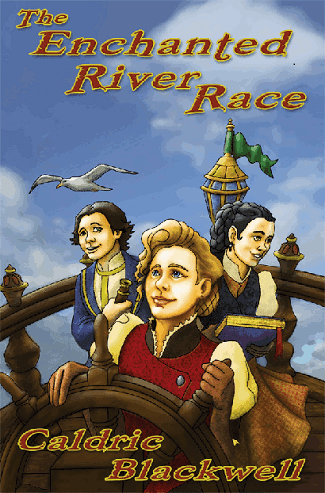 The book follows three children who compete in their village's enchanted river race. The main characters must work as a team to defeat magical obstacles. Who do you think would most enjoy this book? This book is geared toward children, especially those who like action, adventure, and fantasy, who have graduated from picture books yet aren't quite ready to read novels yet. It has chapters and is easy-to-read, yet also has some illustrations to help beginning readers with the text. I wanted to write a story that stimulates the imagination - a story that lets you escape from reality while reading. Do you have a favorite character in The Enchanted River Race? Probably the ship's captain, Amy. She is intelligent and quick-witted yet unsure of herself. In a sense, she's forced to become a leader and realize what she's capable of. Can you tell us a bit about your creative process for this book? The story started with the idea of a race down a magical river where anything can happen. After I established that, I began toying with different outlines for the plot. Do you think your writing style has changed since when you first started? I think my writing has become more organic. I like ebooks and physical books. I hope both experience an increase in popularity! What are your goals as an author for the next ten years? I'd like to experiment with different genres. I'm actually working on a young adult manuscript, which will be coming down the pipeline in the future. Thanks for having me! For anyone interested in my books, please check out my website: www.caldricblackwell.com.